It’s that time of the year when I start thinking about my favorite things and many of them were front and center during a recent holiday season cruise with my friend Tracy. European Christmas Markets and a Sound of Music tour made for a magical girls’ trip on the Danube with Viking River Cruises. I have been on many cruises, but this was like no other. It was solely on the river, allowing us to get closer to cities than you could possibly imagine on a luxury liner. It was also a long ship, only two stories high with 95 rooms. Tracy, who lives in California, and I had actually traveled to Europe previously, enjoying our adventure in Sicily. We had flown separately and met up with the Viking bus at the Munich airport. It took about an hour to get to Passau, where our ship was waiting. It was my first trip to Germany and I learned as we made our way that the cars on the Autobahn really do move as fast as they say. We quickly checked into our Veranda stateroom, which was smaller than most large cruise ships, but comfortable. Dinner had already started before we arrived so we sat quickly and caught up. All meals on Viking Cruises consist of three courses and wine or beer. The food is excellent and there is always enough without ever feeling cruise stuffed. After dinner we learned all about our first tours, which would be in Passau. Tours are included on Viking voyages and it became the norm for us to hear all about the upcoming stops and the tours each evening. You won’t find a lot of nightlife on river cruises mostly because the guests aren’t looking for it. Days are long and active and you’ll find yourself ready to hit the sack by 10-11:00 each night. Our first day on board started around 7:00 am. Breakfast was in the main dining room and was typical European, which I love. There was always a large selection of pastries, breads, fruit, cheese, and yogurt, as well as made-to-order omelets. We were divided into small groups for our walking tour. Local guides took us along the cobblestone streets and the river, then into the town. We watched a demonstration by Simon Confectionary on making gingerbread, feasting on plenty of samples accompanied by Glühwein. 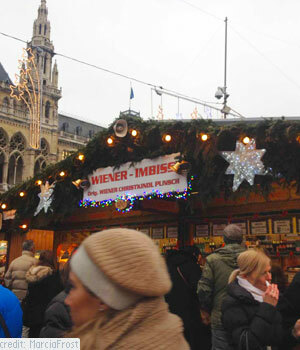 Glühwein, we would learn, was a staple during the holidays in this part of Europe. The original spiced red wine with orange juice had different variations of wine and juices in each place. We finished the tour at our first Christmas Market. I had expected all the crafts, but was surprised to see all the food items, such as donuts, bratwurst, chestnuts and other local favorites. The smells were amazing. Our next port was one I had been especially looking forward to. I had never been to Austria, the birthplace of my grandmother. Not only was I getting a chance to go there, but we would be exploring many of the same scenes used in the Sound of Music, and frequented by the actual Von Trapp family. Tracy and I were ready for our 8:00 am tour. We boarded one of the Viking buses and headed through Linz and onto Salzburg, learning all about both areas from our guide along the way. We loved the town of Salzburg. It was lined with small shops and cafes. We picked one, Café Kugel, for a lunch of Beef Goulash and Apple Strudel. After exploring the place in which Mozart was born, we headed to the oldest Christmas Market in the Alps, right in front of the Cathedral, picking up some souvenirs and tasting more Glühwein. This evening after dinner we had a “Sound of Music” show in the lounge. We enjoyed it, but were glad it didn’t run late as we were exhausted from the day. The ship would make two stops on day three, one to Melk and then on to Durstein, both in Austria. Tracy went to visit the Abbey in Melk while I caught up on some rest. She was back in time for the Austrian buffet lunch, which included Apricot Schnapps, as well as local wine and beer. We arrived in Durnstein in the evening and toured Domaine Wachau winery. I had a private tasting there and was impressed with this 300 year old winery. I loved the 2012 Gruner Vletliner and bought some to take home. I was able to cross off a city on my bucket list when we arrived in Vienna. Tracy and I took full advantage of the time to see the city, shopping at the original Swarovski store, touring around homes that once belonged to Beethoven and Mozart, and looking in awe at the displays of Monet and Picasso in the Albertina Museum. We finished up our day with visits to two Christmas Markets (there are 21 in Vienna) and returned to the ship for dinner. After dinner, we attended an exclusive performance at the Vienna Opera House, an experience I will never forget. We left Austria for a day in Slovakia. It included a tour of Bratislava Castle and the downtown. It was a much less cosmopolitan city than the previous day, but the architecture was stunning, and the people very friendly. 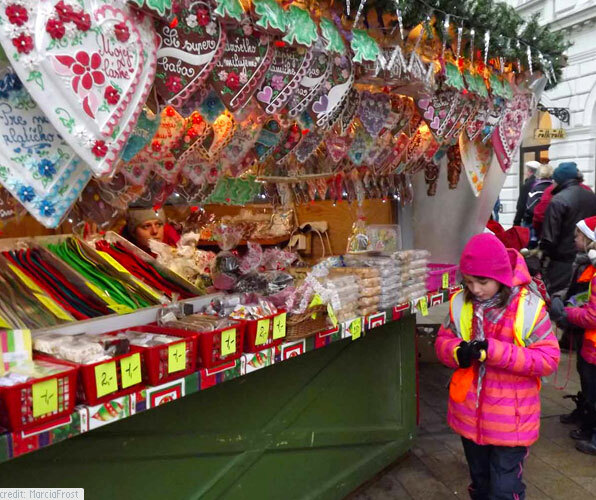 The Christmas Markets in Slovakia had a large selection of wines, cheeses, and candy, which the local children looked at on their way to the ice skating rink. We had time to rest a bit before we got dressed up for the Captain’s Cocktail Hour and Farewell Dinner. It was an extra special meal. We especially loved the salad, which included apricots, blue cheese, caramel, and pieces of cornbread. We managed to stay up a bit later this evening and chatted with some of our new found friends. Since the ship is so small, it’s easy to meet and get to know people. In the morning we arrived at our final stop, Budapest, Hungary. It was a favorite to many and I could definitely see returning for a much longer visit. We did tour the Buda Castle District and then went into the city of Pest to see the National Monument, the Jewish Quarter, and St. Stephens Church. 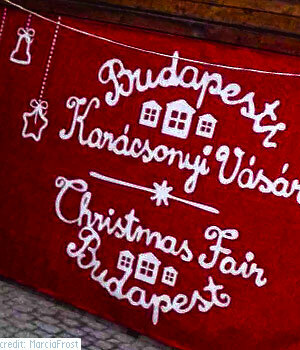 Of course we couldn’t leave Europe without more Christmas Markets and the ones in Budapest did not disappoint. From pig knuckles to gingerbread, there was a little of everything in these markets and we picked up some final presents to bring home. We had one last cocktail party and delicious dinner aboard the Viking Embla before we packed up to go home. It was quite an adventure like no other and I am looking forward to another river cruise someday. Sounds like an amazing trip! It’s always interesting to check out places and see the differences during the holiday season! Thanks for sharing!